Looking back through the year the museum window displays have showcased some very interesting themes & events which, from comments received, have been much appreciated. The year started with the ' Ceasefire Football Match ' which took place on Christmas Day in 1914. This was followed by ' A Spoonful of History ' which looked back at some of the pills, potions & practices prescribed in times past. A celebration of Lostwithiel's much loved 'Glyn Cinema ' also highlighted significant events of the period. 'Anyone for Tennis' depicted the history of tennis, a timely theme for the Queens & Wimbledon season. Not surprisingly the 'Poldark's Cornwall' display has a universal appeal that has attracted masses of attention. 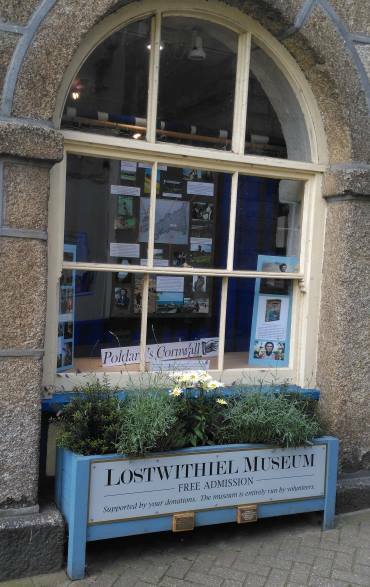 Like the rest of Cornwall, Lostwithiel Museum has also benefited from the so-called 'Poldark Effect.' Thanks to Deborah Clough who has masterminded the window displays; her inspired ideas & creative skills are very much admired &appreciated. There's more to look forward to with further displays before the end of the year.